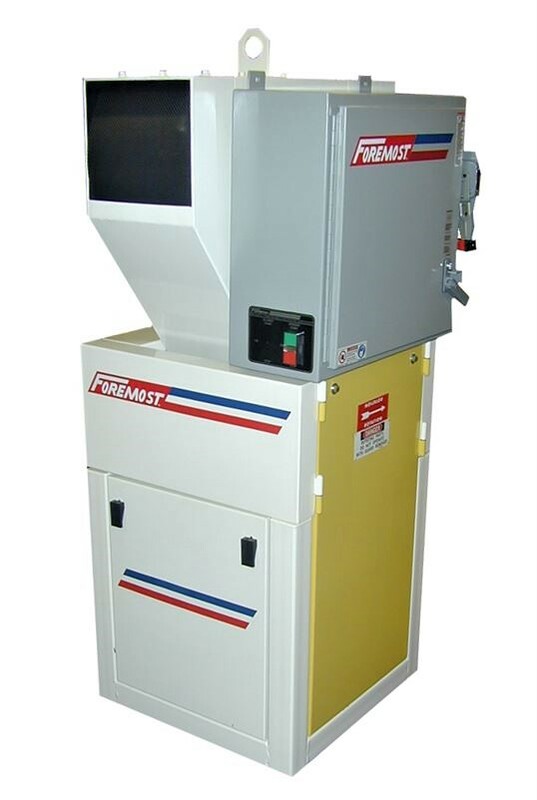 High Shear Granulators – Series 1008 – Foremost Machine Builders, Inc.
Our High Shear Granulators feature a cutting chamber design suitable for a wide range of applications including hot melt, sprues, runners, and small parts. Specific models are available for each type of granulating and all are offered with optional sound attenuation for granulating at under 80 dBA. Without this treatment, a still respectable 85 to 90 dBA range can be achieved. Sound treatment is easily retrofitted whenever desired. The chamber design uses economical flat blade knives in a skewed mount for point-contact cutting against the two bed knives. This, plus an open segmented rotor, yields cool operation and clean cutting with few fines, while contributing to the low overall operating sound levels. General purpose high shear granulators are suitable for batches of sprues and runners, scrap parts, bottles and the like, with a 10″ x 8″ throat opening. It is extremely compact with a 24″ x 33″ floor space requirement and a 4′ height to tray. Caster mounting is standard, as is bin discharge, with blower unloading a popular option. The conventional hopper is fully baffled to minimize flyback. Throat Size 10″ x 8″. Screen Size: 5/16″ standard, others optional. Special alloy knives for longer life Ammeter. Automatic infeed hoppers and other special configurations.